These colorful 10 quart metal buckets feature multiple body swedges, a reinforced wire rim, an offset bottom, and a sturdy handle. Select from 16 solid metal colors for making thoughtful gift pails or creative home decor. These timeless 10 quart metal pails make great Easter buckets, Halloween candy pails, student care packages, get well gifts, and more. Their smoothly painted powder-coat finish makes attaching stickers and labels for personalization a breeze. They can also be used as decorative office trash cans and feature a pre-attached easy-to-carry handle. These colorful 10 quart metal buckets can be ordered in singles or in case packs of 12. Note: The painted buckets are not guaranteed to be watertight. To ensure watertight a bucket we recommend sealing the interior with a clear caulk and allowing to dry before use. We also stock colorful metal buckets in other sizes: 2 quart metal buckets, 5 quart metal buckets, and 4 gallon large metal buckets. All of these options come in 16 bright colors! 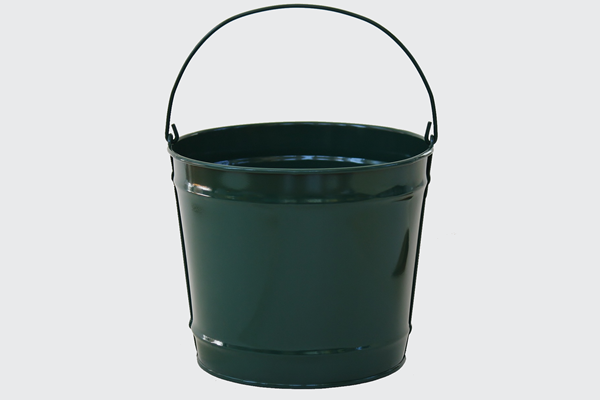 See the more-durable 10 quart hot dipped galvanized steel bucket here.